We started brunch on Mother’s Day weekend two years ago. Since then, we have enjoyed serving hungry diners an evolving menu inspired with full flavors and regional influences. One of the people so instrumental to its success is our AM Sous Chef, Angela Ortez-Davis. Originally from Los Angeles, Angela moved to Seattle back in 2004 to get her undergraduate degree at Seattle University in Political Science and Latin American Studies. According to her, culinary school was a way to avoid graduate school. We couldn’t be more delighted to have this intelligent, kind, and resourceful chef as a part of our team! 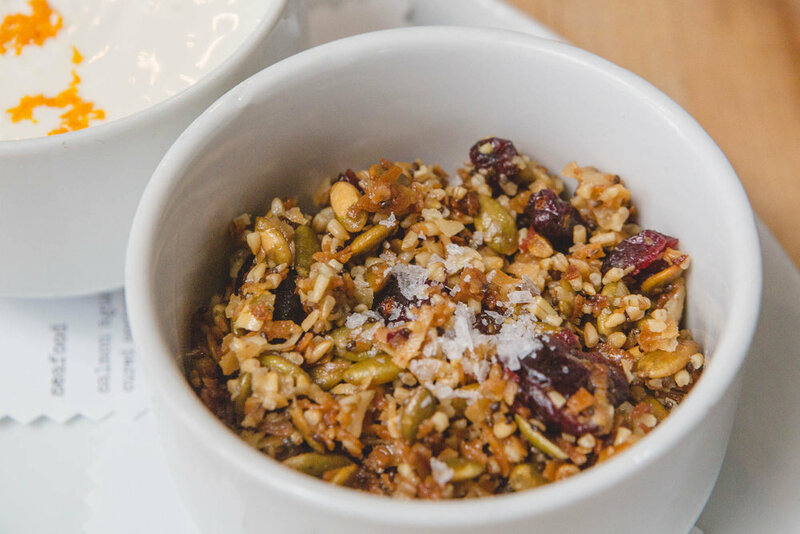 Housemade Granola, (pro tip: get it to-go) made with steel cut oats, coconut flakes, pepitas, dried cranberries, chia seeds, butter, honey, brown sugar, and nutmeg. She accompanies this with house made yogurt. Morning brain power people! Greens, Egg & Ham, (Jen’s personal favorite thing on the menu) made with lentil, spinach, sunny-side egg, lardon, bacon fat vinaigrette, citrus-herb crema. When Angela isn’t working, she’s likely cooking for her husband, playing pinball, or eating out with friends. “For dinner, I love the beef cheeks with masa gnocchi. That texture reminds me of a beef tamal , but feels fresh and new at the same time! Swoon. What changes can we expect to see next on the menu? She’s looking forward to the summertime bounty of corn and peppers, not to mention preserving them for our pantry. I think it’s safe to say a few of us are excited about that too! Thanks to all of you for making our brunch so worthwhile for us to cook and take care of you on weekend mornings!